Holosun 2MOA Red Dot 30MM Solar. The Holosun HS402C has a 30mm objective lens diameter and a 2 MOA dot reticle. It features push button brightness adjustments with 10 daylight and 2 night vision compatible settings. The HS402C is waterproof and has multi-layer coating on all lenses. 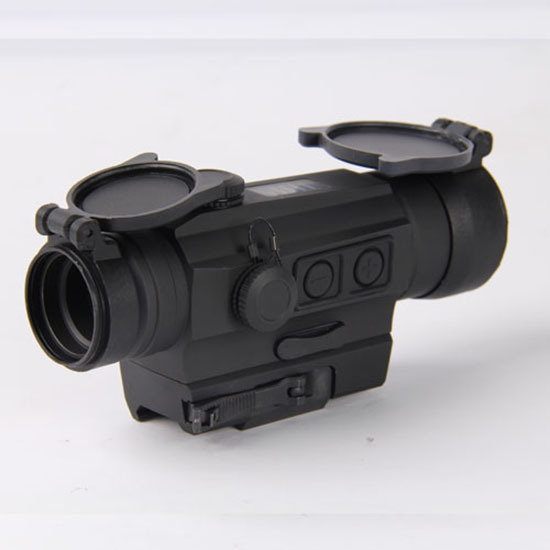 Powered by a single CR2032, this red dot sight boasts an astounding 50,000 hours of battery life. The HS402C has two power systems, one is operated by solar power only while the other operates on battery only. Out of the box, this red dot is automatically solar powered. The red dot intensity also auto adjusts to ambient light. If there is not enough light, such as at night, just press the "+" or "-" button to activate battery power. Now it will operate like a regular red dot so you can adjust the intensity by pressing "+" or "-" buttons. You can verify the power mode by covering the solar cell. If the red dot is on, you are in battery mode. If it is off, you are in solar mode.